Clydebank’s development was inextricably linked to the rise of its industries in the late 19th and early 20th centuries, among which were Singer’s Sewing Machine Factory, the Kilbowie Iron Works and John Brown’s Shipyard. Homes were needed for the workers and soon lines of tenements stretched along Dumbarton Road and Glasgow Road and the new Belmont Street, Alexander Street and Hume Street were laid out. So much housing was built so quickly that the place became known as the ‘risingest burgh’. The Clydebank Blitz of 1941 was a turning point, with over 600 people killed and the town smashed to pieces. It went on to suffer the loss of most of its industry and then what the Luftwaffe hadn’t got the planners did and much of the housing was demolished. Hence the contrast between the bustling town of yesteryear compared with the seemingly soulless aspect of today is dramatic. 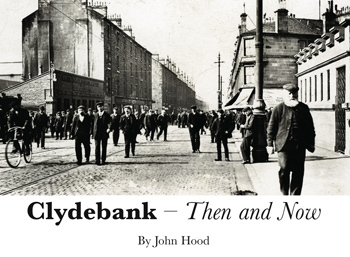 This book, by former local studies librarian John Hood, tells the story of how these changes came about and features 31 views comparing Clydebank as it was and as it is today.